For this piece and many of my pieces I will often start with the idea of a ‘framework’ – of working within/without of a particular shape – rectangular, square, circle etc. 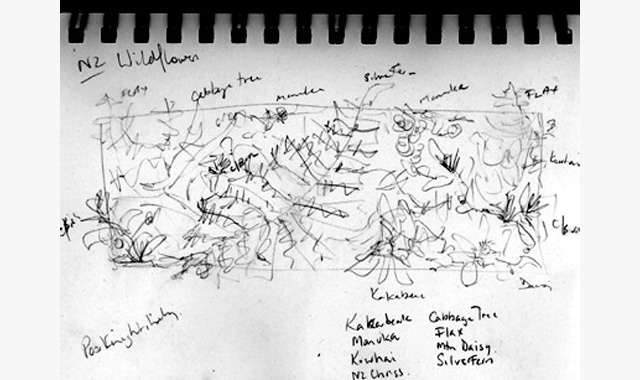 Starting with the framework – drawing up thumbnail sketches of different shapes, sizes, ideas – some people hold their hands up together to create a picture frame to limit their vision and provide a frame to work within for designing the edges of the artwork and what they want in it. It narrows the visual field and helps an artist ‘art-think’ what they are trying to achieve/include within an artwork. A framework can also be suggested by the actual subject matter. So the first step in working in this way is to consider the subject matter – in this case I look at my extensive file of photographs that I have taken. 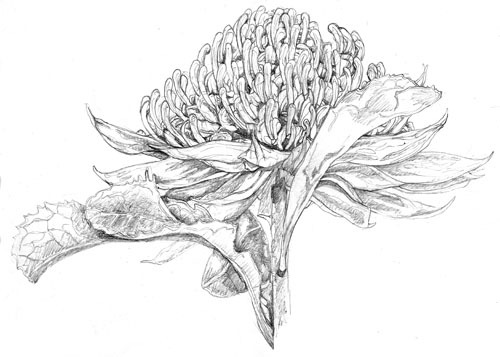 But for me this process means taking one step back again – it begins with the plant/flower ‘in the flesh’. I take the photos I work from, so for me my designing starts with ‘seeing’ and photographing, for me a lifelong interest and passion of seeing and representing through taking photographs and filing and preserving family photographs. So in the case of the above design I look at the plant and take numerous photos (thank goodness for digital it is a lot less expensive these days). The designing and looking is part of the photographing process for me – I was taught a long time ago about the importance of ‘seeing’ through your lens as you take the photo instead of ‘cropping’ later. Not to say I don’t crop but I try to ‘frame’ the photograph in the lens these days. 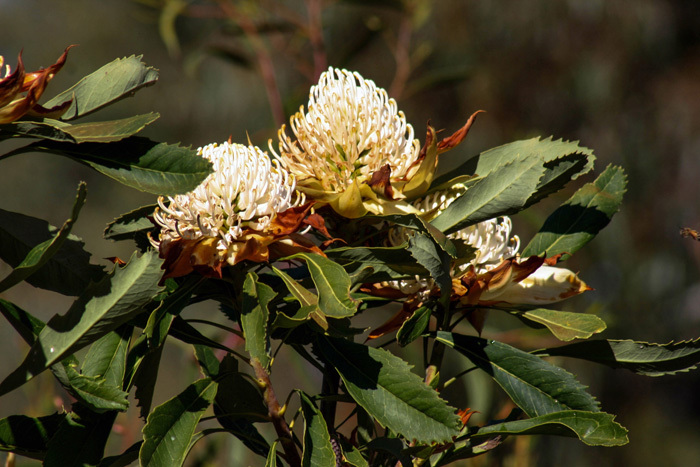 I consider the shape, size and special features of the flowers, buds, leaves, stalks, overall ‘effect’ of the plant. 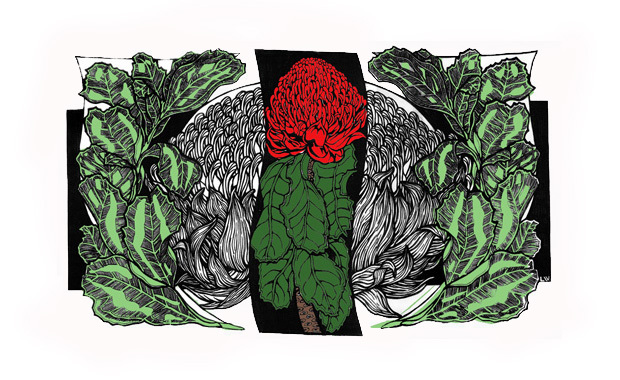 These can be quite quick and spontaneous images – even at this stage I am considering the artwork and what information I may need from the source plant. 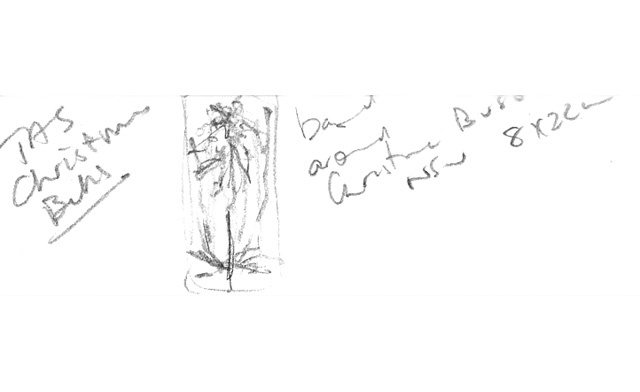 If I have time I sketch the plant or do quick sketches of ideas to refer back to. Somehow for me it involves a different ‘vision’ and thinking – that for the process of this tutorial I am calling ‘art-thinking’. It is like I go to another place that is entirely visual and yet pragmatic about collecting all the info I need, or producing the image/design I want. I am often unaware at this stage of much going on outside this little ‘visual world’ – ask my family who now seem to know that taking a good book and ensuring a coffee shop ‘sanctuary’ is nearby to disappear from their ‘weird wife/mother’ who is off in another head space, and often gets quite excited about a particular plant flowering! 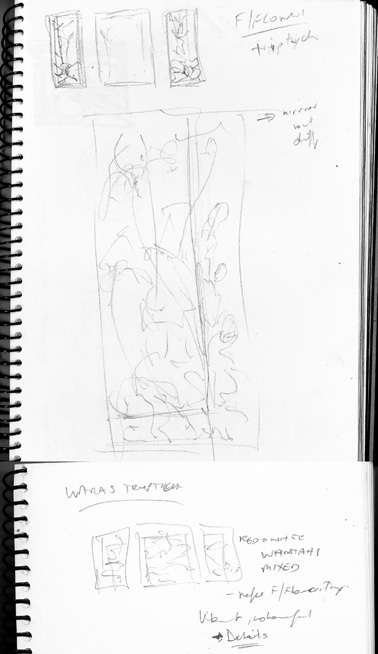 Even before I get the photos I need printed I am often already ‘art-thinking’ – processing visual ideas often making a number of quick thumbnail sketches of my ‘art-thinking’, making notes of ideas in my journals or even on a scrap of paper that I later stick int my journal. These can lay around for even years – I have many in sketchbooks and will often flip back through and find these sketches. They are a rich source of inspiration even years later and often I can then flip back to the process of taking the photos and remember the time and what was significant about the image. Sometimes it feels like a ‘visual memory filing cabinet’ and the actual physical photos (catalogued and filed) help provide finer details and trigger more visual memories that I can use. In designing a piece like the DESIGN ART – Emblems – it is quite complex in the amount of visual material I am wanting to include within the overall design. This means it will be overall quite a ‘busy’ design unlike the DESIGN ART Waratah which is a simple single graphic image relying on this for visual impact. However in creating the overall design for the Emblems I needed to bring some sort of order to the ‘busyness’. I have done this by providing the top central waratah echoed by the Sturt desert pea below. The golden wattle flowers/leaves and kangaroo paw provide framing and visual movement around the design with the Tasmanian gum blossom leaves stabilising the image at the bottom. The other plants of heath (at top either side of waratah), Sturt desert rose on right and Cooktown orchid on left are all pink shaded flowers and seem natural to provide a circular movement around the work. Whilst drawing all of this into a design I can revise the overall and minor details of the plan as I go along. This includes spending often large amounts of time ‘art-thinking’ visually assessing over and over what I am doing and where I am placing the elements within the design. I stick photocopies of the images on the walls – even in the bedroom so I can look at when I first wake up. Often I do nothing but look at the progress, source material, or framework and do nothing – it is all in this process of creative ‘art-thinking’. This includes the inking in of the design – again it is returning to this visual head space where I don’t like to be interrupted – it is like switching my brain into another space. It can be frustrating when I cannot get into this zone and things just don’t work – best to go and do something different. Equally it can be extremely frustrating to have this background zone sitting there with ideas and not the time to actually get it happening! Not everyone understands the process of stepping back and thinking through things – of sorting through ideas, images, assessing, re-assessing and thinking of alternatives and possibilities. Many people are ‘doers’ and impulsive and many artists work this way and create amazing works. I work more spontaneously in the initial stages of thumbnail sketches but then I get tend to move into this more detailed way of working. Funny my house can be disorganised, messy and spontaneous but my artwork processes are often detailed organised and ordered. In designing a larger piece like this I thought I’d give a little insight into the beginnings of the process. It started with a scrappy little sketch on the back of the only piece of paper I could dig out of the bottom of my handbag one day. I had an idea and just had to get the basics down on paper. Progressing on from there I have been researching, photographing, drawing up and developing different aspects of the original sketch. I then photocopied this original drawing and using black permanent markers ‘ink’ in the design as a template for carving. It is at this ‘inking in’ stage that I may also adjust the design and use of black vs white areas. I often re-photocopy, cut up sections, glue on extra areas on or use liquid paper to white out areas. 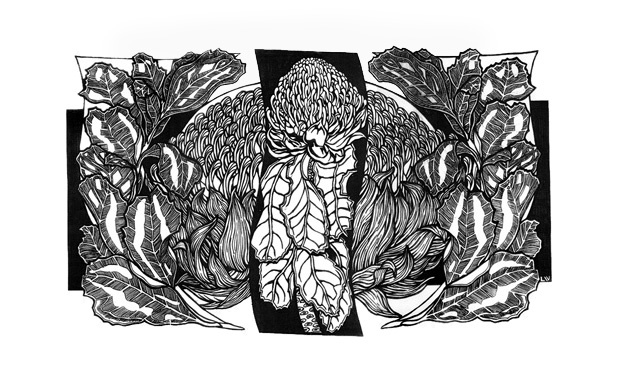 Eventually when I am happy with the final design I will photocopy the design one last time and this becomes the final template I use and transfer to the linoblock for carving. 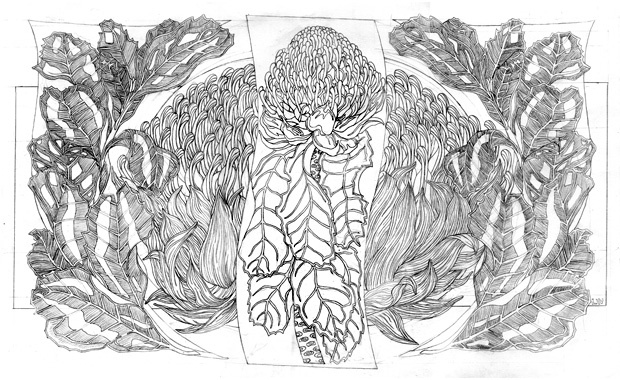 Above is the final blocked in B&W design. Another tool in designing process can be the computer – you can scan in parts and using photoshop (or something similar) move bits around and try out ideas. 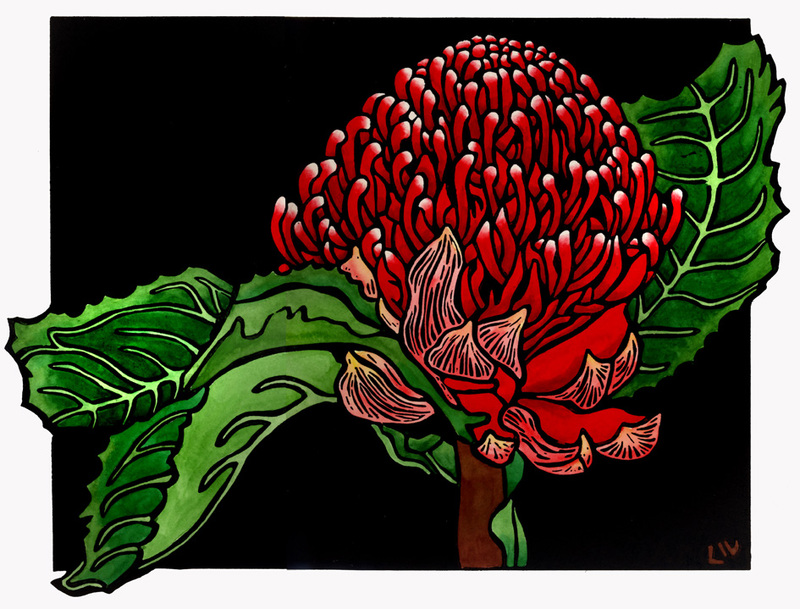 An example of this is the use of photoshop to get an idea of the colour tonal values in this new ‘Waratahs’ design. 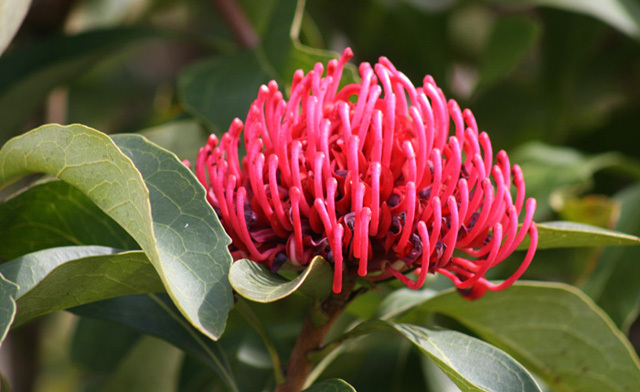 Basically the central waratah will be deep rich colour and the outside leaves will be pale washes of colour – I think they would be paler than here and not this particular green (basically hate both the greens in this photoshopped version but as I said they are only about the tonal values)! 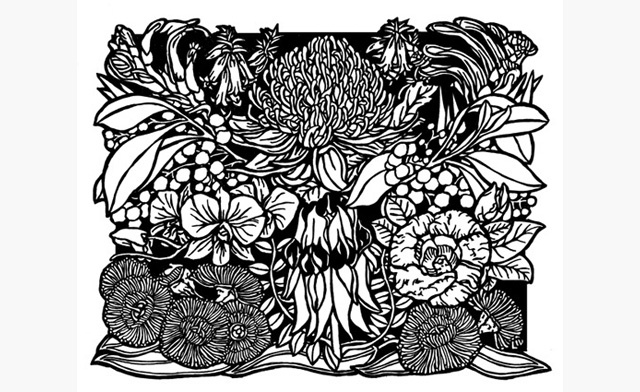 The ‘background’ central flower is black and white patternwork essentially. Although the colours I’ve used in the colour image shown here are really nothing like how it will look – the idea of the deep red/green tone and the pale tones helps me in looking at adjustments I may consider or make in the design. Another method is to photocopy a number of copies – even different sizes and cut them up and work with them to experiment with the design.